You shouldn’t have any problem at all finding a good assortment of Ken Block gear, whether in the DC Shoes store or the Hoonigan online shop. DC offers a strong assortment of Block-themed shoes, while Hoonigan’s go-to product, the “Ain’t Care” shirt, showcases Block driving in the GRC finale at SEMA with the inside of his car on fire. The folks at Puma have greatly expanded their line of Zombie Cat merchandise, celebrating the Subaru Puma Rallycross Team. Fans of Sverre Isachsen will be happy to notice a lot more blue in the mix, as there are now T-shirts available in all three drivers’ colorways, while fans can still pick up the Halloween-themed shoe. Olsbergs MSE gear is available to fans in Europe, but the cost of both the hats and shirts themselves and shipping to America may be a bit prohibitive. OMSE drivers Tanner Foust (through Etnies) and Brian Deegan (through Metal Mulisha) have their own online stores as well. Deegan also lends his name to a line of shoes through DVS. Rhys Millen Racing has plenty of options to choose from, including T-shirts, hats, hoodies, and more. Of course, if you’ve got enough money lying around, you can also buy yourself a Formula Cross ATV to joyride around in. Travis Pastrana’s online store, also through DC, features tons of Boost Mobile-themed gear from his foray into NASCAR. Interestingly enough, though, there aren’t any Red Bull or Dodge-themed products available; there is, however, some Rockstar-themed gear. Speculate at will. Finally, if you’d like to indulge your inner rallycross superstar and have some money to burn, you can buy remote-controlled versions of two of the top cars in the series. Atomik RC manufactures Brian Deegan’s Ford Fiesta in 1/18th scale, as well as his trophy truck and dirtbike. 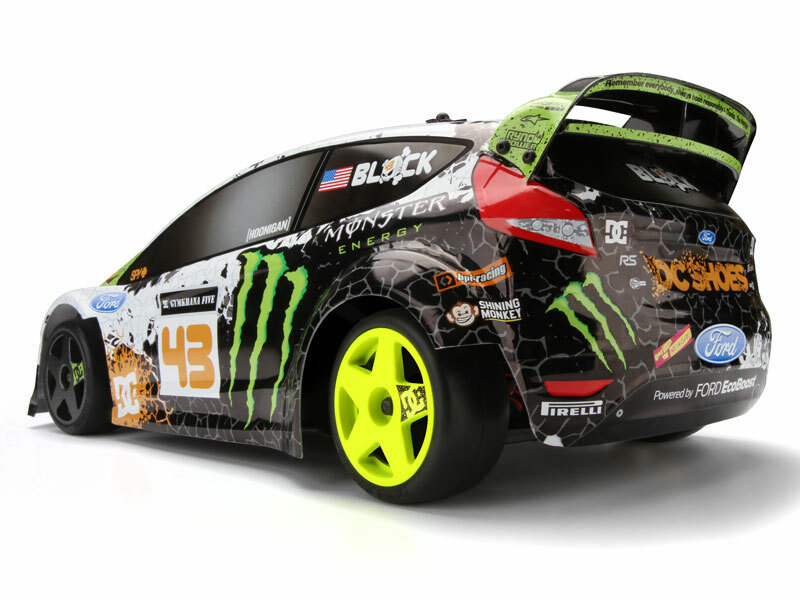 HPI Racing makes a 1/8th scale version of Ken Block’s Ford Fiesta HFHV in its Gymkhana Five livery, while Hot Wheels makes a scaled-down version of its own featuring a fantasy livery inspired by the Gymkhana Four car. Traxxas, meanwhile, manufactures its own rally vehicle in both 1/10th and 1/16th scales; more creative fans can repaint the body to better reflect their favorite driver’s car.